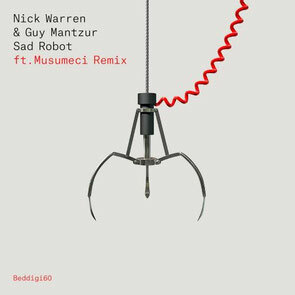 The seeds for this collaboration between Nick Warren and Guy Mantzur were sown a long time ago during snatched conversations at airport terminals, online and at various shows around the world. But, their hectic schedules has meant that patience has been a necessary virtue when it came to actually finding time to work together on this new project. However, the final product, ‘Sad Robot’, finally gets set for release on John Digweed’s Bedrock label. This track should push all the right buttons: a low-slung, percussive groove backbone, peppered with twisted vocal snippets and an ebb and flow of euphoric attitude that comes from years of experience of rocking dancefloors around the world. With an energetic, throbbing remix by Musumeci (aka Sicilian DJ/producer Mauro Di Martino) – this new package from Bedrock is out 16 March. Nick Warren has just recently returned from another tour of South America, and is currently working with production partner Jody Wisternoff on a new Way Out West album. Meanwhile, Guy Mantzur has forthcoming releases lined up on Kompakt and Lost & Found.